September 24, 2013 – IK Multimedia, the pioneer and global leader in music-creation software, mobile apps and music-making hardware for musicians, engineers and producers, is pleased to announce a new version of AmpliTube for iPhone, iPad and iPod touch, the full-featured guitar studio and recording app for mobile musicians, which adds iOS 7 compatibility as well as the ability to use AmpliTube as a filter app in the new iOS 7 “Inter-App Audio” feature. AmpliTube for iPhone, iPad and iPod touch is a full-featured and expandable playing-and-recording studio for guitarists and bass players, vocalists and producers/engineers. It features a complete instrument signal chain, including stompbox effects, amplifier head, cabinet section and microphone, just like a traditional guitar or bass stage rig. AmpliTube is the perfect companion app for IK Lightning-compatible accessories such as the new iRig PRO universal audio/MIDI interface, and the iRig HD audio interface. For the complete lineup of mobile accessories, please visit the IK Multimedia web site,www.ikmultimedia.com/ios. The latest AmpliTube update for iOS is free for existing AmpliTube iOS users. 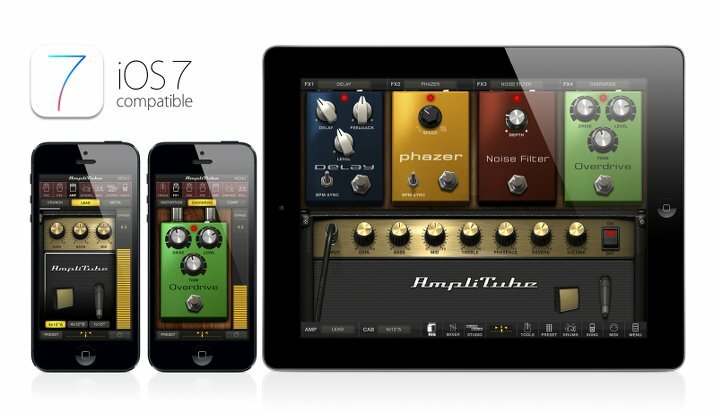 AmpliTube is available on the App StoreSM(www.AppStore.com) for iPhone and iPad for only $19.99/€17.99. A free version is also available. AmpliTube effects and functions can be expanded via in-app purchase with gear from Ampeg®, Fender®, Soldano®, Slash and Jimi Hendrix™, and a complete multi-track recording studio with drummer and DAW-editing features. Be the first to comment on "New AmpliTube® release for iPhone, iPad adds iOS 7 support, featuring Inter-App Audio routing system"